Cocktail manages to present the worst of the 1980’s--greed, machismo, feathered hair, annoying pop songs, and general douche-baggery--in a tight 104-minute package. For those lucky enough to have missed the movie (or the decade for that matter), I would advise steering far clear of this glossy piece of trash. Instead, let me take the bullet for you. I had to watch Cocktail in documenting the booziest films of all time. There is no way for me to un-watch it. Let my trauma serve as a warning to keep other viewers from suffering the same fate. Tom Cruise smugly swaggers through the flick as Brian Flanagan, an army veteran freshly out of the service, who is looking to make it rich in NYC. When he is unable to find a lucrative position, due to his lack of education and experience, he takes a bartending job at T.G.I. Friday’s. Initially, Flanagan doesn’t know a Singapore Sling from a Kamikaze, but the experienced bartender, Doug Coughlin (Bryan Brown), helps the newbie master mixology and numerous flashy bar tricks. Soon Brian and Doug’s showboating saloon skills are in such demand that they move up to a trendy nightclub, serving yuppies and heiresses with big hair. However, the friendship/partnership breaks up due to a bet over Flanagan’s girlfriend (Gina Gershon). Three years later, Brian is tending bar and juggling bottles in Jaimaca, while trying to save up money to open his own place. 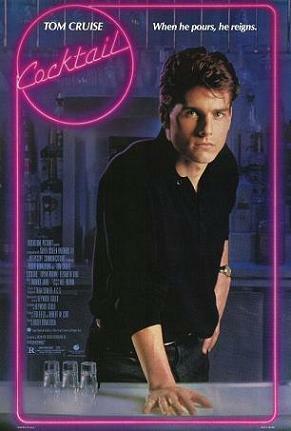 There he falls for a vacationing blonde, Jordan Mooney (Elisabeth Shue). Around this time, Doug also shows up in Jamaica with a hot, rich wife (Kelly Lynch) that has a proclivity for wearing skimpy swimsuits that show off her buttocks. Flanagan manages to torpedo his relationship with Jordan through another bar bet with Coughlin; and then a bunch of other stuff happens, but I’m guessing by now that you’ve lost interest. Cocktail is loud, slick, and vapid--the cinematic equivalent of junk food. The filmmaking and actors are competent, but the dialogue Cruise and company are forced to recite is so laughably bad that it is impossible to take any of it seriously. I kept waiting for Crow T. Robot and Tom Servo to show up make fun of the proceedings, but I ended up having to rag on the flick myself. There are adult beverages galore on display in Cocktail, and the film is undeniably important in drink culture for helping to popularize flair bartending, which involves tossing around bottles and bar tools while preparing mixed drinks. Still, the film is only recommended for the most stout-hearted of soused cinema enthusiasts. Others beware. 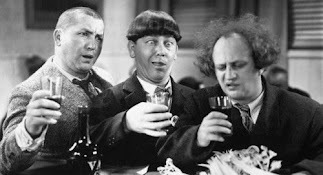 Potent Quotables--FLANAGAN (offered a shot of cognac): I’ll stick with the brew. COUGHLIN: Beer is for breakfast around here. Drink or be gone. Similarly Sauced Cinema--Elisabeth Shue went on to co-star in a much better alky-centric flick, Leaving Las Vegas (1995). My name is Catherine Meyers, I’m the webmaster of a games site and high web traffic blog directory, I've been checking your blog and I find it very interesting, great movie reviews, so I thought you could be interested in a link exchange, (no money involved), with my sites, this might help increase the visits to Booze Movies: The 100 Proof Film Guide, and get nice comments and feedback. Let me know if you are interested to send you the links to my sites.